Happy Lunar New Year! 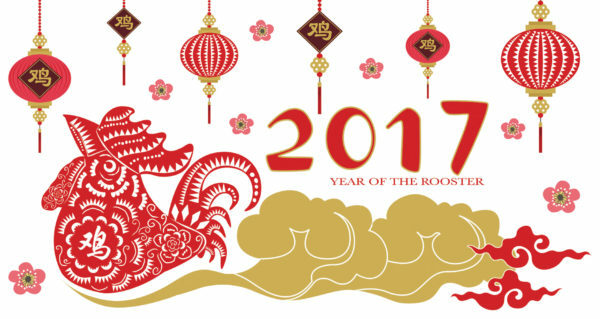 According to the Chinese calendar the 2nd New Moon after the Solstice marks the Lunar New Year! The Fire Rooster’s crow will be sounding the alarm for a collective wake up call and movement in a new direction in this 1 year (2017 = 2 + 0 + 1 + 7 = 10; 1 + 0 = 1). In numerology a 1 signifes new beginnings and creation. The 1 grows, transforms and improves in perpetuity, precisely the way Mother Nature does. In addition, with the Moon in unconventional humanitarian focused Aquarius we are being encouraged to think outside of the box and expect the unexpected. So it’s time to take it to the next level and let your voice be heard, to take a stand for justice, peace and harmony. Share your gifts, allow your creativity to flow and let yourself be infused with the benevolent qualities of the Rooster including honesty, energetic, intelligence, flamboyancy, flexiblity, diversity and confidence. Join us for the for the New Moon Sacred ceremony as we align with the empowering energies of this Lunar New Year/New Moon portal. Starting at 7pm, We will write out what we want to release and what we want to create. The ceremony begins promptly at 7:30pm.